﻿ Smart Business Strategy Using END to END Mobile Phone Integration. Smart Business Strategy Using END to END Mobile Phone Integration. What is mobile phone integration all about, what does enterprise mobile applications do for your business? How enterprise mobility solutions change your business strategy? These are common questions business owners, organizations across the globe ask. In case you too are looking for answers to such questions, this blog shall help you get the right answers. Enterprise Mobility Solutions: What it is all about? So what`s enterprise mobility management? Consider your workplace, there you find plenty of workers using smartphones and tablets. Also, your company has its wireless network deployed there, on which runs your mobile computing. Now with enterprise mobility solutions, you can integrate all these components. With links established between these components, it reinforces the business goals of the employees – use them for activities related to the business. Today, on one hand, you have desktops, laptops, and other devices continuously losing popularity and becoming irrelevant. That leaves an annoying void behind. A technological divide which you as a business owner need to cut across and bridge – as digital connectivity between employee and employer get disrupted. But how do I do it? business owners ask such questions. Before I answer that, let me present some data here. A study was conducted to examine how employees of a company use their smartphones and tablets. And what was found was astonishing. Two-third of such people used their personal devices for business-related activities assigned to them by the company, the study revealed. By 2015, it was reported that employees using mobile devices like smartphones and tablets at their workplaces would be over 1.3 billion. It is 2018 already, and you can imagine the number yourself. With such a huge number of devices at work, the report has revealed that productivity has gone up by 34% – with employees giving companies 240 hours of extra work annually. With 53% of these employees believing mobility has made work easier for them. When the business witnessed such remarkable growth rate and other benefits, now the reports anticipate that companies will invest $61 billion in ventures like mobile app development to enhance connectivity and further narrow down technological and communication divide between the employee and the employer. From the data above I guess it has become clear why businesses need enterprise mobility solutions. In fact, the smart business strategy using end to end mobile phone integration is possible only with the help of enterprise mobility solutions. In today`s business world, physical assets matter less as compared to mobility integration coupled with the latest technology. It requires no special data to believe in services, enterprise mobile applications offers. The role of mobile in the success of businesses is evident. 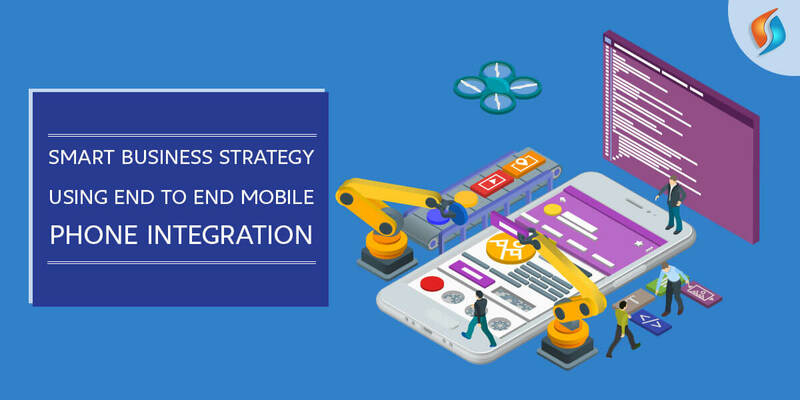 One thing that stands out in the end to end mobile integration is the way it helps companies to go beyond the bounds of geographical borders. The physical locations are now useless in the sense that an employee remains in connect, well in reach even if he may not be physically present in the office. This miracle has been made possible only with the advent of technology such as enterprise mobility management. Mobility offers employees the freedom to access data on their own. What mobility service provider does is that it gives them chances to grow creatively, which is good for the company as they provide you with new business insights. It not only increases productivity, hence profitability, but also gives shape to work culture within your company. It makes the customer care service much easier, transparent and efficient because you have everything in connect, which is important especially when it comes to understanding customer complaints and issues. Get the best ERP system integration solutions today! These are only a few benefits, in fact, you get plenty. At Signity Solutions, hire outsourcing team for your business and get the best enterprise mobility solutions. We at Signity Solutions are the best enterprise app development company in India.